Claims are by far the biggest expense for insurance companies. Claims payouts and loss-adjustment expenses can account for up to 80 percent of an insurance company's revenue. The way an insurance company manages the claims process is fundamental to its profits and long-term sustainability. And the role claims processing plays in customer satisfaction, renewal and retention is just as important. 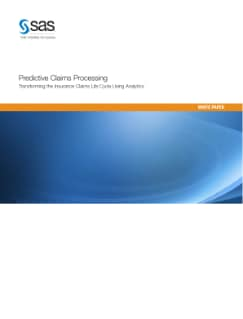 Predictive insurance claims processing, or claims analytics, helps insurers make the right decision, at the right time, for the right party – helping them to differentiate themselves from competitors, achieve measurable ROI and enjoy intangible benefits like better customer satisfaction.